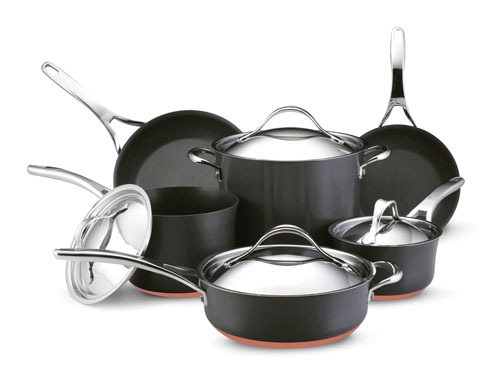 Anolon’s Wicked Awesome Nouvelle Copper Cookware…and a Giveaway! I couldn’t think of a title for this post. I’ve used the “I’m in love” phrase too much. I think you’re going to stop believing me when I say it, even though it’s always true. So, I figured “Wicked Awesome” would get your attention…and simultaneously pay a nice tribute to the New Englanders (make that ‘Englandahs’) in our family. But I digress. I have a random assortment of pots and pans. Some of them I like. Some of them just barely get the job done. This past January I met the folks from Anolon at a food event and they had their lovely Nouvelle Copper cookware on display. 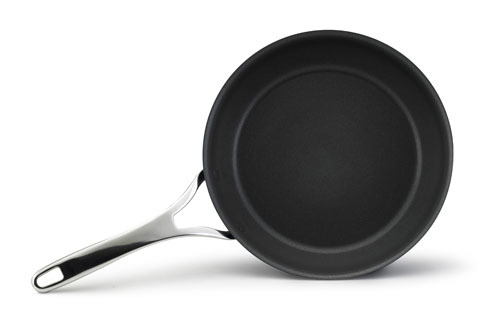 As soon as the representative started describing the features of these pans, my goal in life became to get myself a set. So why exactly did I want to get my hands on the Nouvelle Copper cookware so desperately? They are copper pans at the core, and copper is awesome for cooking. Even heat distribution and whatnot. Anolon Nouvelle Copper is made with DuPont Autograph II non-stick, which is metal utensil safe. Yes, you heard me correctly – you can use metal utensils and scrubby sponges to your heart’s content! The rivets are flush with the pan. Why aren’t all pans made this way? These pans are induction stove-safe, which is perfect for my dream induction stove that I will have one day. These pans have a heavy-duty, high-quality feel to them. And their bottoms? Super heavy. Now I can actually grab my “heavy-bottomed pot” for all those chocolate recipes that heretofore mocked my lack of decent cookware. So, after contacting them and begging a bit, Anolon did in fact send me my dream set of cookware. (Another 10 points for sticking with my food blog all these years! Thank you, Anolon!!!) I’ve had the pans for, oh, 3 months and I still haven’t even mentioned them. But, as you know, I haven’t been doing much cooking lately. The last few weeks, however, I’ve finally gotten to use my beautiful new pots and pans. They are just as wonderful as I’d hoped they would be. UPDATE 3/16/16: We still use these pans every day and I really like them a lot. One of the pots is starting to have some of the non-stick surface scrape off, but it’s only on one piece. So, just wanted to let you know about that! As much as I’d like to share my beautiful set with you, it’s mine and I’m not giving it up! But Anolon is going to give one of you lucky folks your very own Nouvelle Copper 10″ skillet (retail value $79.99)! You want this pan. Trust me. Simply add a comment to this post by Midnight PT on Tuesday, April 5 to be entered into the drawing (one entry per person and must have continental U.S. mailing address). One randomly-selected winner will be announced on April 6! GOOD LUCK!!! 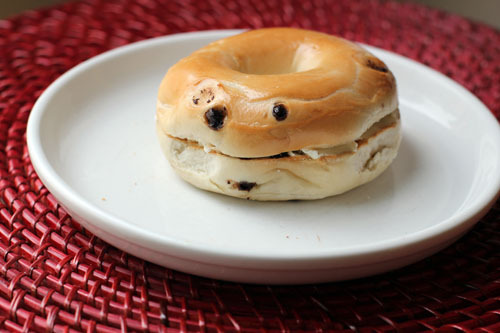 Is it just me or is my bagel smiling at me? – Stuffed Peppers – I’m really hoping I can gear up and make these, we can have them for a few nights and they are so much better than boxed mac & cheese. – My friend Nicole is bringing us dinner. She’s going straight to heaven. – Homemade french fries…at least, here’s hoping I get these made! Now that the pregnant cat is out of the bag, I am being a little more realistic with my public menu plan. I’m really hoping I’ll feel normal again in a few weeks…until then, simplicity is the name of the game! Since I don’t have anything super exciting going on, I am counting on all of you to share your menus and inspire one another! Please share your menu for the week – whether it’s as simple and basic as mine or uber fancy, we love them all! How’s that for a cute title that makes this post sound totally legit even though it really means I don’t have anything to write about because we’ve only eaten boxed macaroni and cheese (at least it was organic!) and rachel sandwiches all week. Well, actually, I DID cook on Monday, but apparently one good meal in a week is still all I’ve got in me. Okay, so a few things I love today. 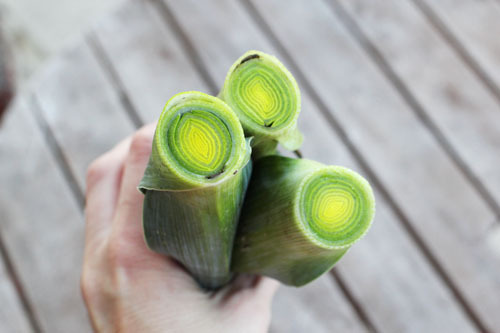 Yes, I LOVE cleaning leeks. Cutting them open and washing out that black dirt is just so, I don’t know, satisfying. 2. Fred’s Steak. 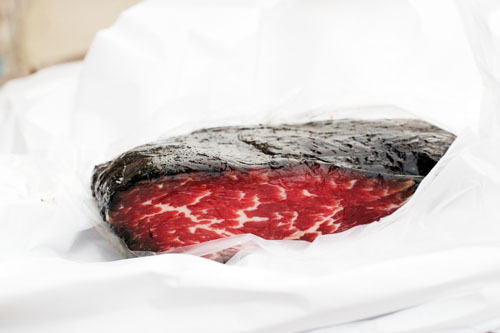 Go on, tell me that meat ain’t gorgeous. I dare ya. A few weeks ago I was craving steak. I needed it desperately. So I turned to one of our favorites, Fred’s Steak, which I’ve written about before. For the LOVE, this stuff is good. And, wouldn’t you know, once I had this, my craving was gone. Thank you, Shaub’s, for helping a poor pregnant lady out. 3. Jake Gyllenhall. I’m resisting the urge to say “Go on, tell me THAT meat ain’t gorgeous” but I don’t want to objectify poor, innocent Mr. Gyllenhaal. Don’t worry, Nate knows I’m in love. In fact, he recorded Jimmy Kimmel for me last night because Jake (yes, we’re on a first name basis) was on the show. What a good husband – Nate, not Jake. Anyway, I already love Jake for being so darn cute and funny…but then I learn from last night’s interview that he loves food. I think I know a food blog you might like, Jake. Oh, and he works with Edible Schoolyard, founded by Alice Waters. Be still my beating heart. So, if you’re looking for a simple, fairly quick and delicious chicken recipe, look no further! Cut up chicken into pieces – either bite sized or cut the breasts into halves or thirds. Regardless, if you do anything larger than bitesized pieces, pound them a bit, too! You could definitely cook the chicken breasts whole, but I would definitely recommend pounding the breast in that case. Remove from heat and add butter. I actually almost always forget to add the butter”¦and it still tastes great. I think the sauce is just a little sharper in flavor when I forget the butter, but a bit more mellow when the butter is added. 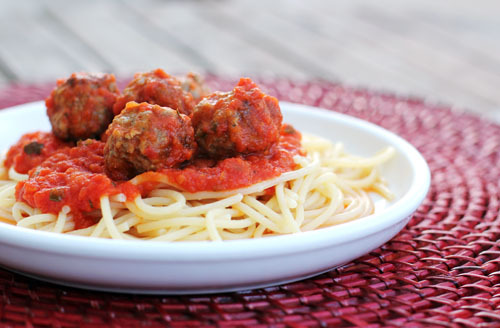 Serve with pasta or mashed potatoes. One more note – last night I only cooked up two chicken breasts, but I kept the sauce proportions the same. Because of that, there was a bit less flour going into the dish, so I had to thicken the sauce up just a tad with some flour while the chicken was simmering. But usually the flour on the chicken thickens up the sauce perfectly on its own. I have something to tell you. And, surprisingly, I’ve kept it a secret for weeks and weeks and weeks. Which is not an easy thing for me to do! Some of you suspected something was up after this post. It was funny, because I actually did have your run-of-the-mill cold that week. BUT…I was also not feeling well for another big reason, and those of you with suspicions were right on! We’re expecting Baby #3 in September! I’m officially done with the first trimester and everything is looking good, so I can finally spill the beans! Yea! 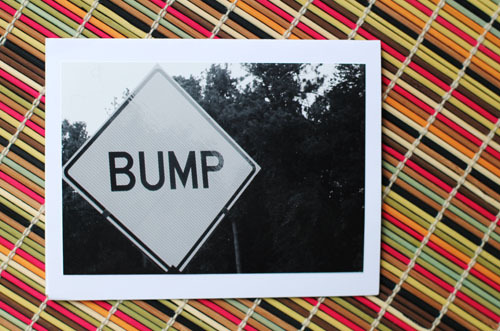 Our friend Ellen Patton sent us one of her completely adorable photo cards when she heard the news. My body doesn’t enjoy the first 18 weeks or so of pregnancy (that may be the understatement of the century). I am oh-so-sick even on medication, which I was expecting, but it’s still no fun…for anyone in our family. And keeping up a food blog has been more than challenging the last 10 weeks or so. In fact, remember the Norwegian Salmon post? Confession: I didn’t actually cook a darn thing on that plate! My friend Nikki, presented as my cooking partner in the post, was in fact the executive chef. I didn’t have to smell fish and just got to show up to take pictures of the final product. Nikki got to keep a whole salmon. Everyone was happy! Despite feeling beyond terrible, I am also feeling beyond grateful and excited for this blessing in our life! And, yes, we’ll find out what this little person is…on April 18, to be exact. Stay tuned! I should feel more normal again in about a month. Until then, I’ll just keep planning menus in the hopes that at least a few of the things I plan get made! Bring on the menus, folks! And have a wonderful week! 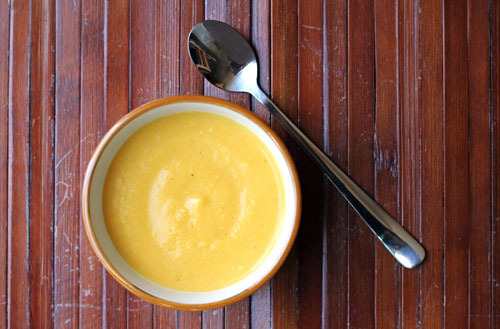 Butternut Squash Cauliflower Leek Soup…my first CSA creation! Happy St. Patrick’s Day, everyone! Every year I try to plan a fantastic green feast. And this year I still don’t know what I’m doing! However, I just took a gander at what we ate last year, and it was great inspiration. 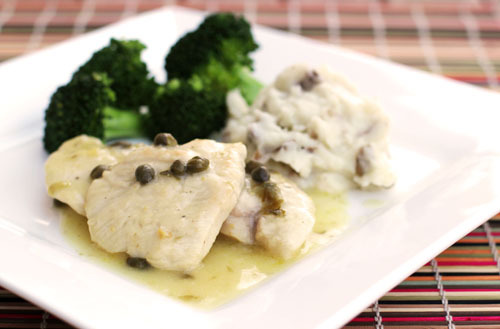 I think we’ll have green chicken piccata, green mashed potatoes (potatoes from our CSA bag) and baby broccoli (also from our CSA bag). I’m sad I didn’t get a corned beef to cook, but maybe we can get one on sale tomorrow and enjoy it a few days late! I do have a good non-green recipe to share with you today, however. Last week I was planning to make butternut squash soup, since I had ordered butternut squash with my CSA bag. When it arrived, I got two baby butternut squashes. While super cute, they weren’t going to provide quite enough squash for the recipe. However, I had three leeks in the bag and a beautiful head of cauliflower, so I made some modifications. The result – a deliciously buttery soup with great flavor! Butternut Squash Cauliflower Leek Soup...my first CSA creation! A deliciously buttery soup with great flavor! Half butternut squash and roast in the oven until easily pierced with a knife, 45-60 minutes. Steam cauliflower until cooked but not mushy. Melt butter in large soup pan. Saute leeks in butter 5-10 minutes, until soft. Add ginger and let cook a minute or two more. Add broth and bring to a boil. Carefully add cauliflower and scoop out the butternut squash from the skins and add to the pot as well. Reduce heat to low and simmer 20-30 minutes. 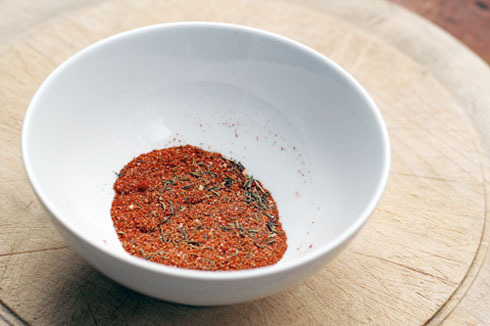 Carefully blend soup in batches until it is all smooth. Season with salt and pepper to taste. Eat! …be sure to check out page 90. All I have to say is, “Woooooo Hoooooo!” I know. Very eloquent and oh so very Martha. 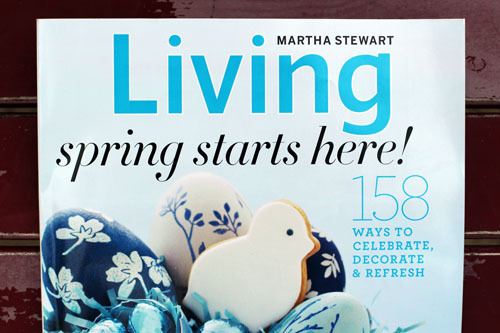 But seriously, I still can’t believe my name, blog, photos and recipe are printed on the pages of a Martha Stewart Living magazine. I’m downright giddy. Okay, enough squealing from Jane. Thanks for indulging me. On to the real reason we’re here! In the not-so-distant past, I was pretty much scared of spicy food. I could barely handle medium salsa, folks. Yes, I was a wimp. Then Nate and I discovered a fabulous Caribbean take-out restaurant in Menlo Park with jerk chicken that is to die for. The chicken is coated in the most delicious but super spicy jerk sauce. The only way I could eat that chicken was if I got tough and faced the heat head on. And I did just that. Not only is that now one of my favorite dishes, but I am in love with spicy food. Bring it on! This year I have the opportunity to participate in a Newman’s Own “Own It” campaign with Martha’s Circle. The challenge is to take recipes and make them your own through simple flavor changes. 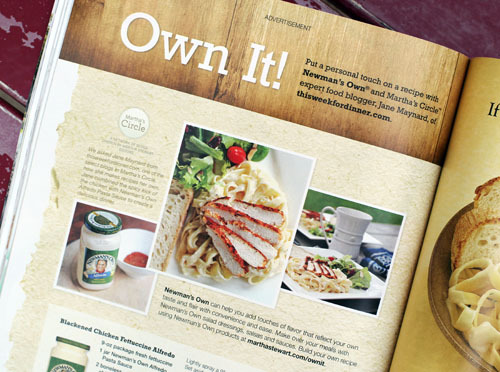 For my first recipe, I was asked to incorporate one of the Newman’s Own sauces into my dish. I started browsing through their sauces and the Alfredo caught my eye. 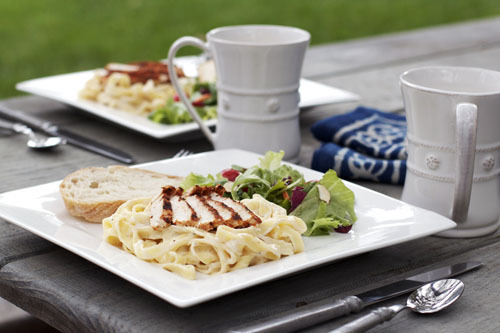 Alfredo is most often simply paired with fettuccine and, if things get really crazy, chicken. It’s a traditional favorite that seemed to be screaming for a new twist. With my newfound love of heat, I decided to kick up the spice factor a notch…or twenty. 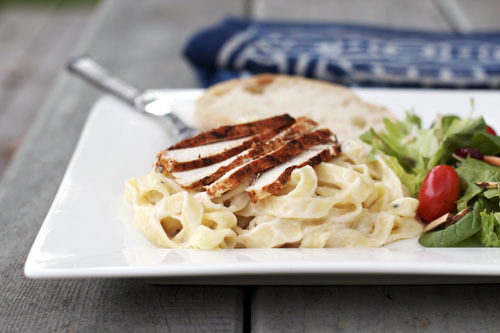 Blackened chicken seemed like a fun and unique twist to the classic Chicken Fettuccine Alfredo. Can I say how glad I am I gave this a try? This recipe is a keeper! Nate and I both really enjoyed it. The spicy kick of the chicken was such a great counterpoint to the super mellow and rich Alfredo sauce. I don’t know if I’ll ever be able to go back to regular old chicken fettuccine alfredo again! Lightly spray a 9Ã—13 baking pan or dish with cooking oil. Set aside. Preheat oven to 350 degrees. Pound the chicken breast until quite thin (around ¼”³ thick). Mix all of the spice ingredients together thoroughly. Coat both sides of the chicken breasts with the spices. Heat a non-stick grill pan or skillet over medium high heat. 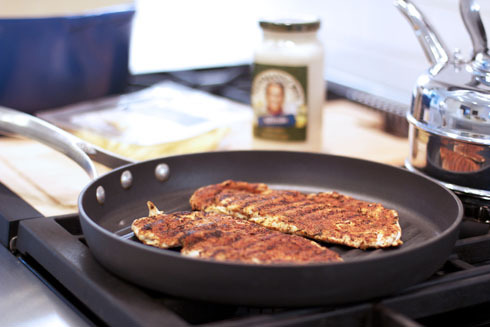 Place chicken breasts in pan and brown both sides, 45-60 seconds per side. Place chicken in prepared baking pan and bake in oven for 5 minutes. Remove from oven and slice chicken into strips. Cook pasta according to package directions. Drain and return pasta to warm pot over medium-low heat. Pour in alfredo sauce and mix thoroughly. Serve pasta with sliced chicken served on top. Serves 4. 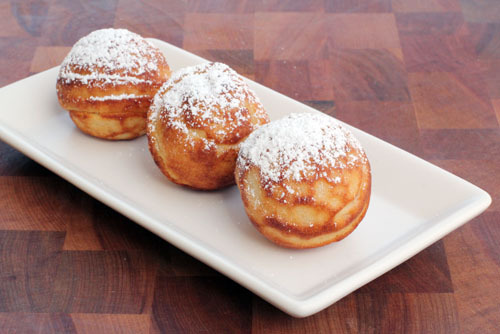 Okay, I promise this is the last Trader Joe’s talk for a while…but I tried the Aebleskiver/Danish Pancakes from the frozen section this weekend and they’re great! The girls loved them. We cooked them in the oven (not the microwave) and they were super crispy on the outside and deliciously soft on the inside. Definitely a better freezer find than the cannoli. I can’t believe it’s time for another menu. I know I say this all the time, but where does the time go?! – Happy St. Patrick’s Day! We’ll be eating something green…need to think about it a bit! – Continuing with the Sunday Breakfast-for-Dinner theme…I think a frittata sounds nice, flavor tbd! Your turn! Please share your menu for the week! I love how many wonderful menus we are getting each week…thank you all! Our neighbors are Swedish and they invited us over this past Tuesday night to enjoy some semlor (plural for semla), a cream-filled bun with almond paste. 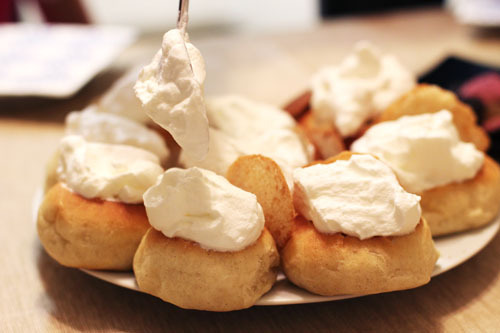 The pastry is a Fat Tuesday tradition in Sweden. Rebecca and David told us that people love the buns so much they start appearing as early as Christmastime and are enjoyed for months rather than just one day. 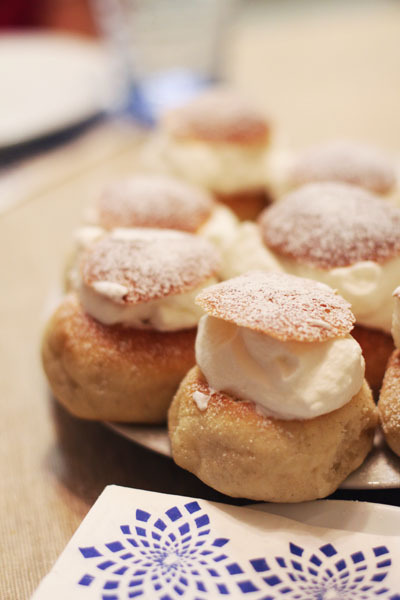 Click here for a fun article about semla. The semlor were scrumptious. Essentially it’s a cardamom bun with almond paste and cream. You slice off the top, scoop out the insides, mix it with almond paste and milk, then add it back to the bun. Top with whipped cream and some powdered sugar and you are ready to party it up Fat Tuesday style. Cate, like a true Kindergartener, barely touched hers. Which means I ate two. And only an unusual amount of will power kept me from finishing off Anna’s as well! I’m including Rebecca’s original measurements so that you can’t blame me if I got the conversions wrong. Which I’m pretty sure I got right. Remember, I didn’t even take one math class in college. But Nate helped, so we should be good. Melt the butter, add milk and heat to 37C / 98.6 F (optimal yeast temperature). Put the yeast in a bowl and add a little bit of the butter/milk mix to dissolve the yeast. Then add the rest of the mix, along with salt, sugar, cardamom and most of the flour (save some for making the buns). Work up a good dough that’s not too sticky. Let it rise under a towel for 40 minutes. Make 12-16 round buns and place them on a baking tray, which preferably has been covered with parchment paper. Cover them with a towel and let them rise for another 30 minutes. Set the oven heat for 225C / 437 F. Brush the buns with the egg. 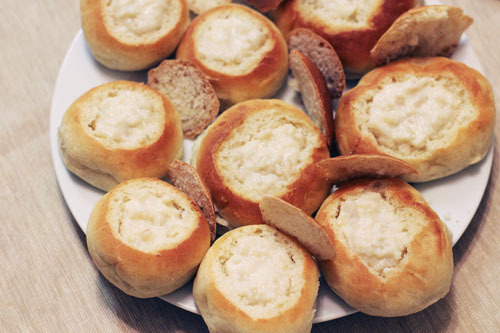 Bake the buns in the middle of the oven for about 10 minutes. Let them cool off under a towel. We asked Rebecca and David how to eat the semlor. They said many people have strong opinions about this and laughed. They like to eat the top and then just pick the bun up and bite right in, which worked well for us!